In addition to the lights, decorations and holiday spirit, locals doing their holiday shopping along Santa Barbara’s State Street may have noticed something else: dark and empty windows. Despite being the city’s iconic commercial corridor and a tourism hotspot, State Street has seen a small but recent uptick in vacancies, particularly in the heart of the city’s downtown zone. Businesses have various reasons for closing up shop, but high rents and competition from online shopping can make even prime real estate like Lower State Street difficult to hold on to. In November, there were roughly 30 vacancies on State Street, with about half coming along the half-mile stretch between Victoria and De La Guerra streets, according to data from Radius Commercial Real Estate and Investments. 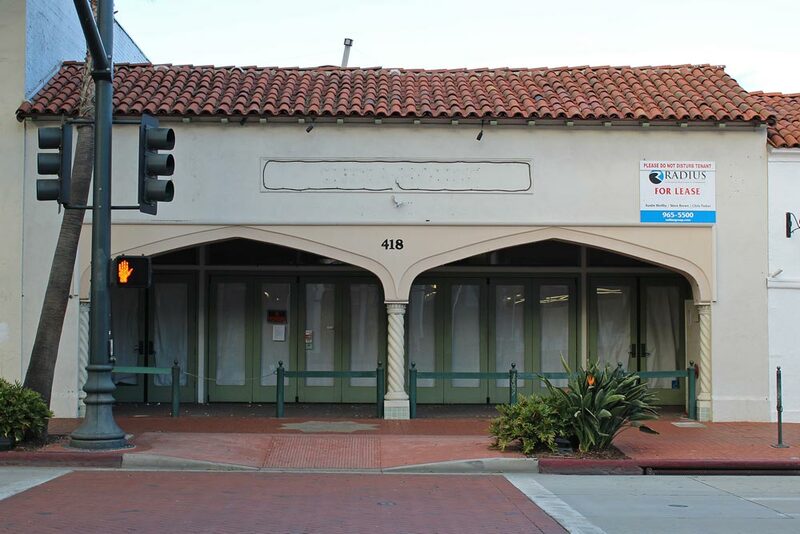 “Our current retail vacancy is Santa Barbara is at 1.6 percent, which gives you the impression that it’s very healthy, vibrant and a very strong market,” said Jim Turner, an agent with Radius. Walking up and down State Street, however, “paints a little bit of a different picture,” he said. Places over 2,000 square feet take much longer to lease and are harder to lease because of the higher overall monthly rent, Turner told Noozhawk. About two-thirds of November’s vacant spaces are at least that size. The average asking rate among the 30 addresses was close to $3.70 per square foot. Many spots have been open for several months, including a handful from 2015 and earlier. In November, some 73,000 total square feet of retail space was vacant on downtown State Street. He said the costs and time needed to obtain a permit for tenant improvements has also contributed to the difficulty of opening a retail business in the city. Included is the ever-growing “Amazon effect” — competition from online shopping sites that offer a wide array of products that don’t require one to leave the house. “We have a very niche retail sector here in Santa Barbara,” Oplinger said. The relative lack of broad-based, big-box retailers that keep consumers coming back year-round contributes to the cyclical nature of local business, he told Noozhawk. The struggle isn’t universal, he noted. Some businesses, like artisanal home-goods store Plum Goods Santa Barbara of 909 State St., are actually expanding. Owner Amy Cooper now sells what she calls ethical and sustainable men’s and women’s clothing in the space next door, products she said are not currently offered elsewhere in town. The key to her success, she said, is providing customers, many of whom are from out of town, shopping and retail experiences that they can’t have back home or online. Kenny Slaught, the founder and president of Investec, a real estate company and State Street landlord, says that although there has been a small uptick in vacancies, the notion that there are an exceptional number is overblown. The main complaints Investec hears from tenants, he added, regard the homeless, downtown parking and the time, effort and money it takes to get through the city’s permitting processes. Some State Street owners refuse to budge on their terms for a lease, Slaught said, but there are myriad other issues behind the scenes that lead to closures, like businesses not paying their bills on time or unrelated legal trouble. According to Jim Haslem, a business leasing expert and founder and CEO of the consulting firm CS Advisors, dark stores suggest a disconnect between a landlord’s rent demands and what a tenant can actually afford. “There’s a lot of talk about market rents, but market rents don’t correlate with the right rent,” he told Noozhawk. Landlords, he noted, still prefer a higher rent even though what “they think is fair-market” rent tends to cause “churn” — the revolving door of businesses coming in and dropping out of a location. Many businesses, especially restaurants, work with only a thin profit margin and can’t afford to raise their prices to keep up with rent hikes because consumers will look elsewhere, Haslem said. Insurance providers see vacancies as higher-risk, he said. A year after opening in November 2014, sales began to gradually decline at Still — Elevate Your Ethanol, a cocktail-accessories and barware store that closed Dec. 24 at 37 E. Ortega St.
After the initial media attention wore off, most foot traffic continued to remain a short block away on State, and customers opted for online alternatives, said owner Jeremy Bohrer. Though the customers who came in told them how much they loved Still, they also mentioned that they hadn’t previously heard about it, said Sayward Rebhal, who ran the business with Bohrer. Rebhal diagnosed the struggles of local small businesses as a lack of support from City Hall and little apparent willingness on the part of locals to support the businesses they lament are disappearing. That the retail corridor is not meeting its full business potential has not escaped the attention of the Downtown Organization of Santa Barbara, a nonprofit membership organization that promotes and serves downtown businesses. “We have retail most cities in America would kill for,” Executive Director Maggie Campbell said, adding that the area had never had much need to recruit businesses. Her organization, however, is undertaking a study to understand how to improve the retail mix on State Street and its immediate surroundings. Downtown Works, a retail market analysis consulting firm, will begin the study in January, performing a trade-area analysis and assessing the commercial zone’s current retail mix before recommending a strategy for how to improve that mix, Campbell told Noozhawk. Downtown Works’ final report and vision is expected in May, and is paid for by private funds from contributors concerned about the present retail mix, she said. The goal isn’t to just fill vacancies, but to bring in businesses that will be successful and good neighbors, Campbell said. The results of the study, she added, could be a resource to real estate brokers as they bring in new businesses and used to inform current retailers’ business decisions. Bohrer, Rebhal and Cooper all agreed that the downtown organization has been a boon for small business. “I have a lot of hope that State Street’s going to get better and go back to it how it used to be when I first moved here 20 years ago,” Cooper said.